This listing is for a Boutique Metallic Ribbon Holiday Hairbow! VERY SPARKLY! These are hand-made by me! 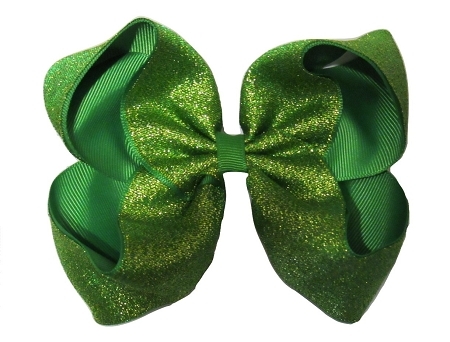 The Hairbow is made out of a sparkly metallic green ribbon! The Hair Bow has a loopy bow design! These Boutique Bows are approx. 5 inches wide. The Bows are mounted on an Alligator Clip lined with the same color ribbon! Great for Birthday Parties, Easter, Valentine's Day, Christmas Day, Winter Festivals, Fall Festivals, Portraits, Pageants, Holiday Vacations, Birthdays, New Year's Day, and more! Your daughter will love these bows! Check out my store for other hairbow colors & styles!